The global economic crisis that has shaken the real-estate industry has one tenant organization in East Harlem celebrating victory over a British landlord. Dawnay, Day purchased 47 buildings in the neighborhood for a quarter of a billion dollars in March 2007. It was the British firm’s only foray into the U.S. real-estate market, following the lead of several large property firms that over-leveraged their investments in New York City residential buildings over the last couple of years and are now paying the price. The London-based company, which manages more than $10 billion in assets worldwide, has become one of Europe’s most high-profile casualties of the international financial crisis. It is now under the administration of accounting firm BDO Stoy Hayward and the real-estate advisor DTZ, which are charged with restructuring the company and selling its property holdings. Neither BDO Stoy Hayward nor DTZ would comment on the status of the transactions. But according to PropertyWeek. com, final bids were submitted November 7 by Threadneedle, F&C REIT Asset Management, Criterion Capital and Exemplar. Two unknown U.S.-based cash buyers are submitting bids as well. Organizing in the buildings began more than five years ago, when they were owned by Steven Kessner, who was once named one of New York’s ten worst landlords by the Village Voice. Originally, about 15 tenants met in the lobbies of their buildings to discuss ways to confront Kessner and get him to make repairs. They expanded their initiative to his other buildings. 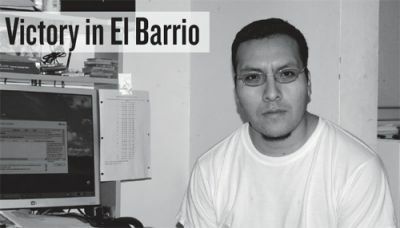 Since they had little experience organizing, the tenants turned to Juan Haro, who once worked organizing restaurant workers, to help them develop a strategy. 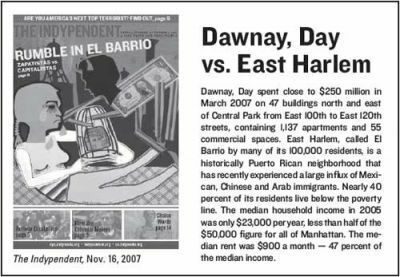 After MJB held protests to draw attention to Kessner’s negligent management practices in East Harlem, he sold his 47 buildings to Dawnay, Day. MJB decided to put the British financial firm on notice. Dawnay, Day representatives clearly stated their intentions to the British press. Blakeley added that he was attracted by the opportunity to raise rents on vacant apartments. “With renovation, a flat could well take $1,700 a month once re-let on the open market,” he said, adding that long-term tenants could be bought out. “They were planning to take advantage of New York’s lax rent laws,” Haro says. Andres Hernandez lives with his family in a Dawnay, Day building on East 117th Street. He gestures toward a gaping hole in his kitchen wall, near the stove. He says the superintendent replaced the apartment’s small boiler with an electric heater months ago, but has not yet sealed the wall shut. “People in the building say they want to force all the Hispanics out and fill the building with white people,” he says. Carolina Ortega has lived with her father and her children on East 116th Street for decades. She says Dawnay, Day has tried to force them out by ignoring their pleas for extermination of the rats and roaches that infest their apartment. MJB has filed a lawsuit against Dawnay, Day, claiming the company violated consumer- protection laws by using deceptive business practices. Despite the company’s financial turmoil, MJB says it does not plan to drop the suit. MJB’s attorney, Ed Josephson, recently filed a motion to obtain Dawnay, Day’s financial records. He says the company was slapping tenants with suspicious bills, citing charges they did not owe. Tenants say the company offered them buyouts of $10,000 to vacate their apartments. They have also reported that Dawnay, Day charged them for ordinary maintenance and for washers and dryers that they do not have. Dawnay, Day isn’t the only private-equity company that over-leveraged its investments in rent-stabilized apartment buildings. A recent report by the Association for Neighborhood and Housing Development (ANHD) states that from 2006 to 2007, projected income — not actual income — was used to justify inflated loan amounts for an estimated 90,000 units of affordable rental housing in New York City. Perhaps the most notable example was Tishman Speyer’s purchase of Stuyvesant Town and Peter Cooper Village from MetLife. The firm bought the 80-acre, 11,200-unit complex of mostly rent-stabilized apartments for a recordbreaking $5.4 billion in 2006. In late September, Standard and Poor’s downgraded ratings on 22 classes of mortgage-backed securities related to these properties. It estimates that the complex is now worth 10 percent less. In Harlem, Riverton Houses and Savoy Park are on the verge of default as well. Their new owners failed to meet their projections that they could double or triple their income by bringing rents up to market rate. According to the ANHD report, which cites SEC “Free Writing Prospectus” filings, Savoy Park’s landlord had anticipated increasing its net operating income (NOI) from $7.4 million to $19 million over a five-year period. The owner of Riverton Houses believed it would increase its NOI from $5.2 million to $23.6 million in the same timeframe. Although investors claimed they could turn over the rent-stabilized apartments at a rate of 20 to 30 percent each year, the reality is that tenants won’t move out voluntarily at that rate, as they know they can’t find equivalent affordable housing. The average annual turnover rate is 3 to 5 percent, making the quick profits these firms envisioned next to impossible without employing high-pressure eviction tactics. Haro says it’s unlikely the tenants will have a cordial relationship with another big financial firm. Members of MJB were poised to travel to London to confront Dawnay, Day when they heard the news that the firm was collapsing and had to sell its property holdings. They recently held a march in East Harlem to celebrate their victory. Hernandez says the Dawnay, Day tenants aren’t fearful of the future. “We are very happy,” he says. “We feel it is a great success for us. [Dawnay, Day] is a powerful, rich company, and it has fallen as a victim of its own devices.